Ban items and blocks from vanilla Minecraft AND from any mod installed. Limit the amount a player can place of a specific kind of block. Prevent the use (left/rightclick) of certain items in creative. Make players unable to move valuable items over from creative to survival. Prevent interaction with other inventories in creative. Prevent the dropping of items in creative. Disable the right/left clicking with items. Highly customizable: Prevent clicking on a block/in the air/in safezones. De-charge EE "Tools" upon entering a marked SafeZone. Force Ring of Arcana into "Earth" mode to prevent griefing. Advanced integration with WorldGuard and GriefPrevention to mark all regions or specific ones as safezones. Basic integration with Towny, Factions and PreciousStones to mark all regions as safezones. Prevent the crafting of banned items and warn players so they don't waste ingredients. 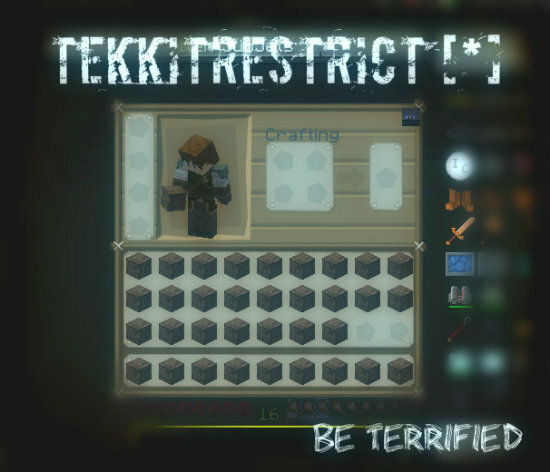 As of v1.19, Tekkit Restrict can prevent crafting of banned items in ALL crafting tables, including project tables and automatic crafting tables, by integrating with forge. Set the maximum EU charge Electrical IC2 items can hold. Change the speed at which Electrical IC2 items charge at. Set, change or remove EMC values from any item or block. Ability to set a command that will be executed after someone has duped x amount of times. Ability to set a command that will be executed after someone has hacked x amount of times. Split the server log output into various other files. Filter out certain messages so they don't show up in the console. Forcefully unload chunks when the total number is getting too high. Prevent the placement of certain blocks next to locked machines/chests, to prevent people from stealing stuff with buildcraft pipes. Display the server time used by each and every eventlistener on the server to see what plugins are causing lag. Open and modify the alchemy bags and inventories of people, online and offline. Teleport to places where there are alot of items on the ground. Patch ComputerCraft to make sure people can't crash your server with ComputerCraft scripts. Set the minimum time for RedPower timers to prevent lag. Tekkit Restrict has a built-in auto-updater, which connects to BukkitDev to check for updates. If you want to change or disable this behaviour, you can change the update settings in the General.config.yml file. In what way do you want to limit emc farms per rank? Limit them as in the physical contraptions? or make it so certain ranks can use certain emc farms? For the first one (physical contraptions), I don't believe that can really be done automatically. As for the second one (certain ranks use certain emc farms), that wouldn't be possible either, however it would be possible to do this with dupes. Looks like you forked TR, made any progress with some of the broken things that Taeir had implemented into it with his 'special library'? No one can right or left click it is unusable. The only way I am able to get it to work is if I set the charge to 0% using ModModification.yml. I am using Tekkit Classic 3.1.2 (MC 1.2.5) I did not addded WARNING [Config] NEI because I have not idea how, not can I find it. I know this is an old outdated plugin, but I was hoping someone knows how to fix this. Is it possible to limit EMC farms per rank? This plugin is for Tekkit Classic, not Tekkit Legends. It's not likely to be compatible, seeing how the minecraft versions and mod versions are entirely different. Do any versions work with Tekkit Legends? Does this plugin work for Tekkit Legends? I am looking for two more developers who would be willing to branch and do ports to the most recent versions of CraftBukkit. Naturally, this would include removing EE2, but there are still quite a few features that would be nice to add to new servers, such as the anti-hack, safe zones, limited creative, limiter, log splitter and so on, which should still be supported in craftbukkit. With this point, I may also become active again to add new features and do a bit more performance and error debugging. Please email these request to: eternialogic@gmail.com, which is the email that I have been using for years now. Make sure to include your github and bukkit usernames so that I can look over your previous code and possibly add you to the project. This also means that you may make changes to the original TekkitRestrict alongside the new port. WARNING [Config] NEI Give can only be logged if you have installed the NEI patch in the fixpack. It allows you to break 3 blocks at a time (instead of the default 1). Please could you add the ability to disable the swift wolfs rendering gale and the other flying rings capability in the safezones as sometimes you don't want people to be able to fly around freely at a spawn and I want them to keep their inventory's. Your plugin from what i have seen is one of the best for this thing and any other plugin man not be able to disable it. Please add this to a future update as this plugin is the only solution I can see that will actually work. One was custom written to do that on our server. It's a real easy plugin. We have not really had any complaints at all. It seems that there is a bug with buildcraft pipes being able to create a glitched item when pumping items into a condenser, which then can be used to create infinite EMC as it never goes away unless moved by a player. I'm doing the last year of my degree at the moment so I know how time consuming that can be! I keep meaning to update some forge mods I maintain from 1.6.4 to 1.7.10 but never seem to find the time. At the end of the day 'real life' has to come first so no need to apologise, I for one am grateful you did such a great job after taking it over as a lot more useful features are stable now and without this plugin and your patches my Tekkit Classic server would have taken significantly more time and effort to maintain over the last couple of years. Thanks!